Plans to visit beautiful Vermont this December? Please stop by Brattleboro to say hello, enjoy a cup of cider and view artwork inspired by the wilds of Vermont. I will be exhibiting new work this month at 133 Main Street, Brattleboro, Vermont. This special showing of pastels,”Who Robbed the Woods: Paintings from the Forest”, will be open for viewing on weekends from December 5th through the 21st. The opening reception is December 5th from 5:30 – 8:30 p.m. I will be donating a percentage of the proceeds to the Halifax Conservation Group, to protect the forestland surrounding my studio and gardens from the threat of development. Information about the Halifax Conservation Group and a donation box to support the cause, will be available throughout the exhibit. 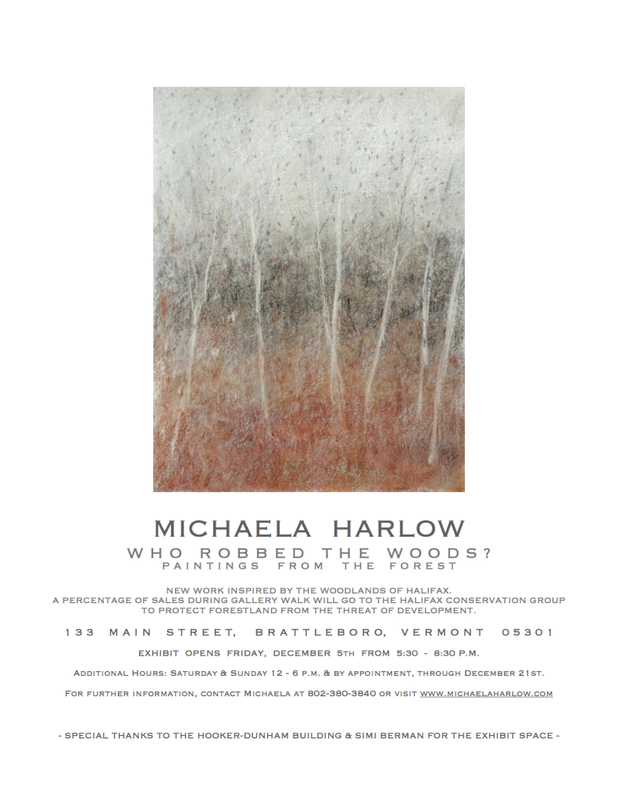 For a preview of work, please visit my website here: Michaela Harlow. § 2 Responses to On Exhibit: “Who Robbed the Woods?” Paintings from the Vermont Forest"
It surely would have been wonderful to have been able to get down to see it in person, but I do hope your exhibit was an incredibly smashing good success!! You are currently reading On Exhibit: “Who Robbed the Woods?” Paintings from the Vermont Forest at The Gardener's Eden.